Farmhouse ale styles are known for being messy, sprawling, ill-defined categories to the point where it can be questioned whether they really are styles at all. The Lithuanian style keptinis, however, has a simple definition: it's made from malts that are baked, often in bread shapes. Keptinis actually means "baked," just as in the name of the excellent Lithuanian beer snack kepta duona (baked bread), which is bread sticks baked in oil and garlic. Unfortunately, the baking is just about the only point that all sources agree on. There are two beers that claim to be keptinis on the market today: one is the only beer that Ramūnas Čižas makes, the other is brewed by Kupiškio. Even though I'd visited Čižas and tried both beers I couldn't really answer the question of how this style of beer is made. After my visit to the library and some volunteer translation work by Remigijus Tranas that changed. There seem to be four ethnographic papers that to some degree describe the brewing of keptinis (Astrauskas 2008). Unfortunately, I only have a translation of one of them, but that seems to be the most thorough, so I'll chance a description based on this paper (Petrulis 1975). That paper in turn is based on questioning of just two people, so it's not clear how definitive it is. In addition, Geir Ove got hold of the 1994 issue of Zymurgy, which has an article by Michael Matucheski on keptinis. And, I got some input via email from Simonas Gutautas of Dundulis. This blog post is the result of me trying to combine all of these into a coherent style description. Today keptinis is associated with the area around the town of Kupiškis, but it's clear that it used to be brewed in a much broader area in north Lithuania. I've also seen references to baked beer in other Nordic sources, so very likely baked beer has not been a purely Lithuanian thing, but this aspect is still vague. Looking at the beer itself, the first surprise is that Petrulis claims it was usually made from three types of grain: drooping brome, barley, and oats. Brome is generally considered a weed, but it's sometimes used as fodder for animals. I asked Simonas Gutautas and he says for keptinis you would (if you were poor) use whatever grains were available, but barley was probably preferred. So while the people Petrulis interviewed used brome, this probably wasn't a general rule. Matucheski appears to agree with Simonas. Anyway, the grain is malted in the usual way. Then the malt is mixed with hot water to a thick mash, which as far as I can tell is not left to stand, but then put into the oven at a thickness of 17-19 cm on top of a layer of straw. Some people form bread shapes from the mash, while others just make a thick layer. It should then bake until it's brown says Astrauskas, while Petrulis says it should be black as coal and crisp. Matucheskis says to bake at 177 degrees Celsius until the top forms a hard crust, usually 20-30 minutes, "but try not to let them brown". Simonas says "a toasty crust" should form. After baking, take the baked mash out and crush it with mortar and pestle, then mash it in the normal way together with hops and lime tree bark (Matucheski says lime tree flowers). The mash is left for 4-5 hours, and covered so that it will stay warm. No sour mash, in other words. Then, strain it through a cloth into the fermentation vessel and let it ferment. Neither Petrulis nor Astrauskas says anything about adding yeast, but Matucheski says yeast "was usually added". Petrulis says you'd use 1 pura of grain for 125 kvortas of water. That is 70 kilos of malts and 102 liters of water. The amount of hops would be depending on personal taste. Matucheski says for 19 liters of beer: 1 kg pale barley malts, 2 kg rye, and 2 kg oats, giving an original gravity of 1030 and a final gravity of 1010, which means 2.6% alcohol. That sounds very low. The two commercial beers are 5.2% and 5.7%. According to Petrulis and Astrauskas keptinis is brown-black, with a sweet-sour taste, and "thick, sticky, heady". (Doesn't sound like 2.6% to me.) Simonas says it should be "reddish brown, rich in dextrines, full-bodied, sweet in taste and hoppy." He agrees there could be some acidity from the toasted malts. Matucheski says it's "gently sweet-sour" at first, then growing more "lactic" with time. Matucheski suggests using Belgian wit yeast, which might not be a bad suggestion, as Lithuanian brewers would use family yeast. The commercial variants are not sour, so I don't think keptinis should be considered a sour style. Using a home-brewer's calculcator, if I plug in 70 kilos of chocolate malts and 102 liters of water, assuming 70% efficiency (probably a bit on the high side) and 75% attenuation, I'd get an OG of 1120 and an FG of 1030 for 11.8% ABV. These figures are very rough, but probably much closer to the actual beer than 2.6%. At a guess, I would assume typical ABV would be around 8-9%. According to Simonas, making keptinis requires a large oven (for typical farmhouse batch sizes) and a lot of time, so it's not easy to find any more. He implies there are still people other than Ramūnas Čižas who brew it. He also says Dundulis may brew a keptinis this year. I really hope they do. 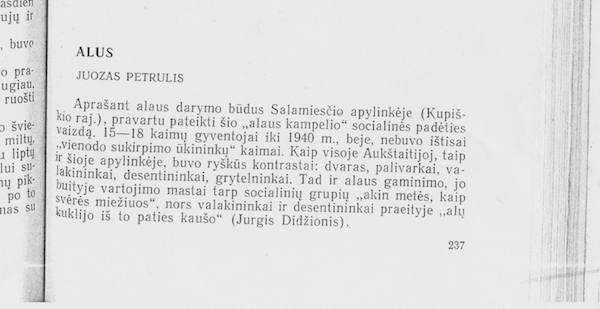 Keptinis Alus, Lithuanian Baked Beer, Michael Matucheski, Zymurgy - Special Issue: Traditional Beer Styles 14, 1994-1. Based on Markuza-Bieniecka (below). Chłodnik znad Niemna: kuchnia litewska by Biruta Markuza-Bieniecka, Watra, 1989. ISBN 8322502354. Thanks to a helpful reader on Facebook I now have this book. Per barzda varvejo..., Vacys Milius, in Mokslas ir gyvenimas, 1969, nr 2, p 51. @Morten: Yes, I didn't bring it up in the text, but it is kind of hard not to think of bappir. What's missing is any kind of plausible link between the two. That could be just absence of evidence, although probably there is no link. I think there may be some vagueness of the size of kvorta (quart), and accordingly, of the volume of water used. Does it implicitly say 102 liters of water in your source? The thing is there were a few sorts of quarts in different times in Lithuania. Kvorta in general was 1/4 of gorčius, and gorčius in Lithuanian Grand Duchy (XVIII a.) were two types - the big, or the guild gorčius (5,64 l), and the small, or �inkorinis (barkeeper's) gorčius (2,82 l). Hence Lithuanian guild quart would be 1.41 l, and the small quart 0.7 l. I also find mentions that during tzarist Russia, it appears that Russian quarts were adopted as well, with big quart size of 1.537 l, and small quart 0.82 l (?). I you take big quarts, you should be in the ballpark of 5-6% ABV.